Why don’t the Japanese pro baseball stadiums have out-of-town scoreboards, and why do many of the main ballparks not display the home-run distances on the fences? These questions are asked often, but there does not seem to be a definitive answer to either. At Yomiuri Giants games at Tokyo Dome, the other game scores are flashed on the main scoreboard only once and not until the middle or at the end of the eighth inning. And I do mean flashed; you need to look quickly and know the kanji or katakana characters for the team designations, or you will not get through them. The scores are up there for only about 10 seconds at the most. In North America’s Major League Baseball, all 30 stadiums have an out-of-town scoreboard. Some of them are iconic, such as the one at the base of the Green Monster at Fenway Park in Boston. Some have an inning-by-inning line score, such as at the Chicago Cubs’ Wrigley Field, while others display the score, inning and uniform numbers of the pitchers currently in the games. If you bought a scorecard, you could look up those numbers and know who is pitching or when a pitching change has been made. Fans at American or National League parks react with a roar of approval or groan of disappointment, depending on the updated scores involving rival pennant contending teams, as they appear on the board for all to see. In contrast to the infrequency of out-of-town score reports at the ballparks in Japan, TV and radio broadcasters report what’s happening around the leagues as the scores come in. Sure, in this day and age, anyone with a computer or a smartphone can access various websites for up-to-the-minute scores of games. TBS’ Excite Baseball is one of the best. But, when you’re at the stadium, there should be an ongoing account of the other games in front of your eyes all day or night long on an easy-to-see scoreboard. Hopefully, as new ballparks are built in the future or renovations are made to existing facilities, the designers will include expanded scoreboards to let everyone know what is happening with rival teams around the country. As for the home-run distances on the fences, about half the parks in Japan do not display them. There is no indication at Tokyo Dome, Nagoya Dome, Seibu Prince Dome, Jingu Stadium and Yokohama Stadium of how many meters there are from home plate to the left — or right-field foul poles or straightaway center field. Curiously, when Major League teams opened their regular season at Tokyo Dome in 2000, 2004, 2008 and 2012, the stadium people affixed temporary signs on the outfield wall, indicating it is 100 meters (328 feet) down the lines and 122 meters (400 feet) to center. Then, as soon as the MLB games were done and the teams returned to the U.S., the signs were removed. 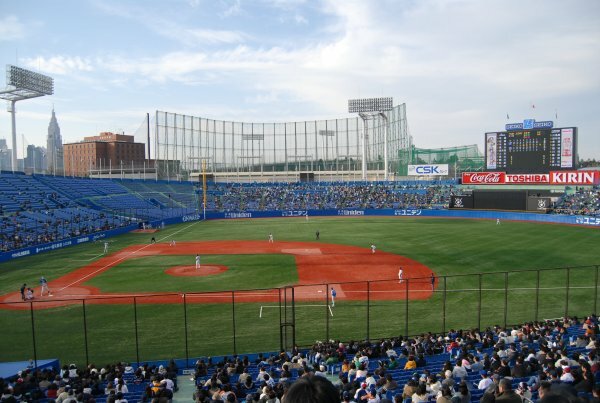 Along with new asymmetrical stadiums and maybe putting grass on the infield at Koshien Stadium, having out-of-town scoreboards and displaying the home-run distances at the ballparks in Japan would make Japanese baseball more major league-like, don’t you think? Maybe sell some scorecards too.